IN DIFFICULT FISHING SITUATIONS on spring creeks and tailwaters, anglers often pin their hopes for success on a fly box full of imitative patterns and advanced presentation skills like stack mending and curve casting. This makes sense, since the ability to match the hatch and present the fly with minimal drag are often what separates this “technical” fishing from other stream fishing for trout. Unfortunately, many anglers forget that these advanced techniques should be an overlay on more fundamental skills, and not a replacement for them. A friend, Chad McCormick, once related an anecdote to me that serves as a perfect illustration of this attitude. Chad was fishing the lower Bighorn with fly shop owner George Anderson a few seasons back, and it was Bighorn fishing at its best: little yellow stoneflies were skittering all over the surface, and the fish were keyed into both hatching insects and returning egg layers. With lots of bugs and lots of rising fish, if the angler put the fly on target, the result was a hookup with another 15 to 20 inch fish. At least that’s how it worked for George and Chad. They noticed another angler fishing the riffle just upstream, making cast after cast, changing flies frequently, conspicuous because he wasn’t catching a thing. All the while, he was forced to watch the anglers below him hook and land and release a considerable pile of fish. Finally, after several more fly changes, this fisherman couldn’t stand it any more. “What are you guys catchin’ ’em on?”, he yelled. Rather than work on perfecting our own abilities, we tend to look for a magic fly pattern (or invisible tippet material, perfect fly rod design, etc.) to catch fish for us. Amusing because it contains an insight into a typical human foible when it comes to fishing skills (and a lot of other things, for that matter). Rather than work on perfecting our own abilities, we tend to look for a magic fly pattern (or invisible tippet material, perfect fly rod design, etc.) to catch fish for us. Unfortunately, that approach doesn’t work. The best fly pattern in the world won’t catch fish if the fish doesn’t see it. Casting accuracy is a basic component of all presentations, but in tailwater and spring creek situations, it is often critical. With lots of naturals on the water, the fish will not move far for a meal, and inaccurate casts won’t even garner a feeding fish’s attention. On the other hand, even a badly tied or oversized fly will catch some fish if it is presented precisely in the fish’s feeding lane. So what is involved in making an accurate cast? Gary Borger provides a useful delineation of the components of accuracy in his book Presentation (Streamworks, 1995, 319 pages): there is distance accuracy, which involves casting the correct amount of line (i. e., not casting beyond or short of the target), left and right accuracy, and pinpoint accuracy, which is a combination of the two. Separating distance from alignment is a valuable insight, because these different types of accuracy are often required in different fishing situations, and they are achieved by different parts of the casting stroke. In this column, I will discuss some of the fishing concepts involved in accuracy; in the next issue, I will take up the the techniques and casting mechanics of accuracy. Once the fish or its lie can be determined precisely, alignment accuracy must be added to the equation. This “left or right” accuracy is what allows the angler to place the fly in a position where it will drift naturally into the fish’s range of vision. In other cases, the angler will rely directly on vision to determine the casting target. 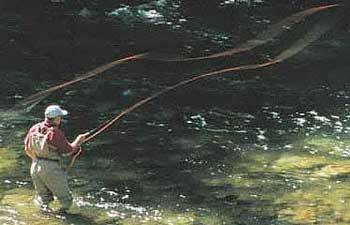 In spring creeks and tailwaters, this can be as straightforward as stalking and casting to a visible fish. Careful observation will also allow the angler to identify casting targets in other ways: spotting the shadow of a fish, noticing the subtle riseform of a bulging fish or the flash of a nymphing fish as it turns under the surface of the water. Once the fish or its lie can be determined precisely, alignment accuracy must be added to the equation. This “left or right” accuracy is what allows the angler to place the fly in a position where it will drift naturally into the fish’s range of vision. If the cast is made too far to the downstream side, the fish won’t see the fly (or won’t have time to take the fly in its normal feeding rhythm). More often, I see anglers make the opposite mistake—they lead the fish way too far to the upstream side, and by the time the fly gets to the fish, it has drifted laterally out of the fish’s feeding lane. In heavy hatch situations, it is easy to get excited by the sight of a pod of big fish feeding in a small area, but accuracy requires that the angler pick an individual target. Flock shooting is as ineffective for the flyfisher as it is for the wingshooter. Accuracy is also dependent on the angler’s ability to see the fly as well as the target, as the angler needs to see whether the fly is landing in the correct position. One of the keys to spotting the fly (and distance accuracy in general) is to know the length of the leader, so the angler’s eye can move to the approximate landing zone of the fly. In flat light, it can be difficult to see a small spring creek pattern, and in windy conditions, the tippet and fly may be blown well away from the intended target. If the angler can’t spot the fly at all, there is no way to correct errors in fly placement and there is little chance for success. There is nothing more frustrating than straining to see the fly and then realizing—always a second too late—that the last rise was to your fly, which was several feet away from where you thought it was. In these situations, I recommend changing to a more visible fly (like a parachute style or a “hi-vis” pattern), even if it is less imitative. If the angler is presenting the fly with a reach cast, another effective ploy in bad light or windy conditions is to hold the reach upstream until the fly begins to skate. The waking fly is easy to see, and the fly can be steered into the right line of current, at which point the rod tip can be dropped to allow the fly to drift naturally to the fish. This intentional drag requires a fly that doesn’t drown easily—a Sparkle Dun or parachute style emerger is my personal choice for this technique. Accuracy is one of the keys to effective fly presentation, but remember that there is more to accuracy than just casting. Identifying the target and seeing the fly are crucial elements, but planning one’s approach is important as well. If the angler knows a long (and accurate) cast is beyond his abilities, it may be possible to wade closer. If the angles of wind and current make a particular cast difficult, reconsider the situation and try a different casting angle. Most importantly, careful observation of the situation should allow the angler to make an accurate presentation on the very first cast, which is the one most likely to take a fish.